There are no restrictions for registering a .FI domain name. .FI can be registered both by individuals and companies, a local administrative contact is not required. Is local company in Finland required? A local company is not required for registration of .FI domains. Is it necessary to have a local administrative contact in Finland? A local administrative contact is not required for registration of .FI domains. Are trademarks applicable in Finland? 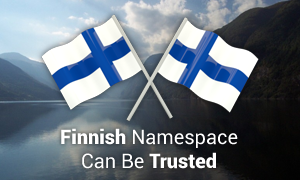 We highly recommend securing your domains with matching Finnish trademarks. Registering a local trademark, a European Union OHIM trademark or a Madrid trademark designating Finland will protect your domain name against complaints from competitors or other third parties. Registering a Finnish trademark costs approximately € 650,00. We will be happy to assist you with acquiring one. For more information, please feel free to send an email to support@europeid.com. Registration of IDN's with the full character sets of the Finnish as well as Samí languages is available. Are generic domains available for .FI domains? There are no limitations for generic domain names with .FI. However, the .FI registry has a short list of premium, reserved and banned names which can not be registered at the moment. Usually, it does not take longer than 1 day to register a .FI domain in Finland. We will submit the application as soon as possible. However, we cannot offer guarantees as we have no impact on the speed of the Finnish domain authority once the domain application has been submitted. What is the minimum number of characters a .FI domain name can consist of? Applications for .FI domain names with less than 2 characters cannot be accepted. What is the maximum number of characters a .FI domain name can consist of? Applications for .FI domain names with more than 63 characters cannot be accepted. Is it possible to register more than one Finnish domain name? Registration of multiple .FI names is allowed. There are no limitations. If you choose to use your own DNS, all specified name servers must be operational and respond authoritatively for the .FI domain. Accepted payment methods for .FI domain names include Visa, Master Card, JCB, DanKort, PayPal, Visa Electron, Maestro, UnionPay, American Express and wire transfer. If you need more information or have questions about the .FI domain registration or transfer, please contact us at relations@europeid.com or via phone on: +44 (0) 208 133 3994.